The Hitman 2 April Roadmap has been released, and it details all of the content coming to the game in April 2019. For starters, you can get your hands on the Mumbai Master Challenge Pack immediately which will unlock the Magnesium Pouch upon its completion, followed by a Legacy Elusive Target on April 12th, The Prince is returning to Sapienza, and on April 17th, you can play the new Ghost Busters featured contracts. Even more activities will arrive later in the month. On April 25th, you can play the new Escalation Contract titled “The Nolan Disinfection” where you are tasked with making use of deadly poisons to eliminate your targets. On April 30th you can try out the new Ghost Mode location, Santa Fortuna, along with 4 new items to throw off your opponents’ game: The Outfit Manipulator, the Ghost Freeze Grenade, the Ghost Flash Grenade, and the Ghost Proximity Explosive. Other things coming out on April 30th include some new items, a Phantom Suit, and new Ghost Mode Emotes for players to use. A major update is also planned for release on the 30th so stay tuned for further details regarding exactly what it will change, IO Interactive will also be holding a livestream in April. Check out the trailer for Hitman 2‘s April Roadmap! If you’ve never played a Hitman game before, you play as Agent 47, a genetically-engineered contract killer. In each installment of the series, there are various levels to play, spanning all over the world, and it is up to you to decide how you are going to beat them. Personally, I like to play these games as stealthily as possible, but if your play style is to run and gun, more power to you! In Hitman 2, the more you play a level, the more items you will unlock. This encourages players to try out different playstyles and learn new routes to assassinate your targets, adding hours of replay value to the game. 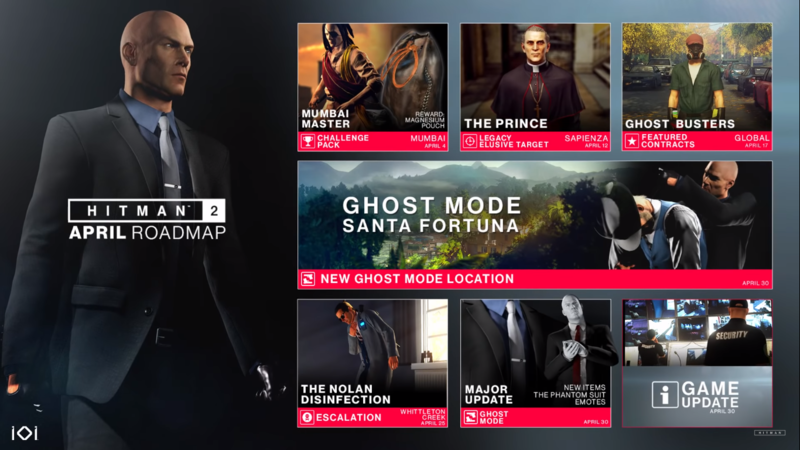 Are you excited for the content coming with the Hitman 2 April roadmap? Let us know in the comments!